It's been a few weeks since my last post...and as I mentioned then...2013 will be void of any letters from John W. Derr. The letters of 1863 are lost to time and therefore there will be a gap between letter #31 and letter #32 of approximately 15 months. I thought that this might be a good time to reintroduce my other great-great grandfather, John Zartman Wagner...or John Z. for short. I mention John Z. in a few prior posts but it is probably a good time to reiterate his service in the war. 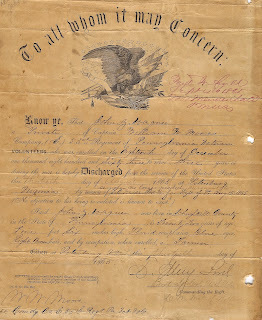 John Z. Wagner was born on September 27, 1841 in the Deep Creek area of Barry Township. A farmer and laborer by trade, John Z. enlisted in the United State Army on April 20, 1861 as part of President Lincoln's call for volunteers during what was supposed to be a 90 day suppression of the rebellion. 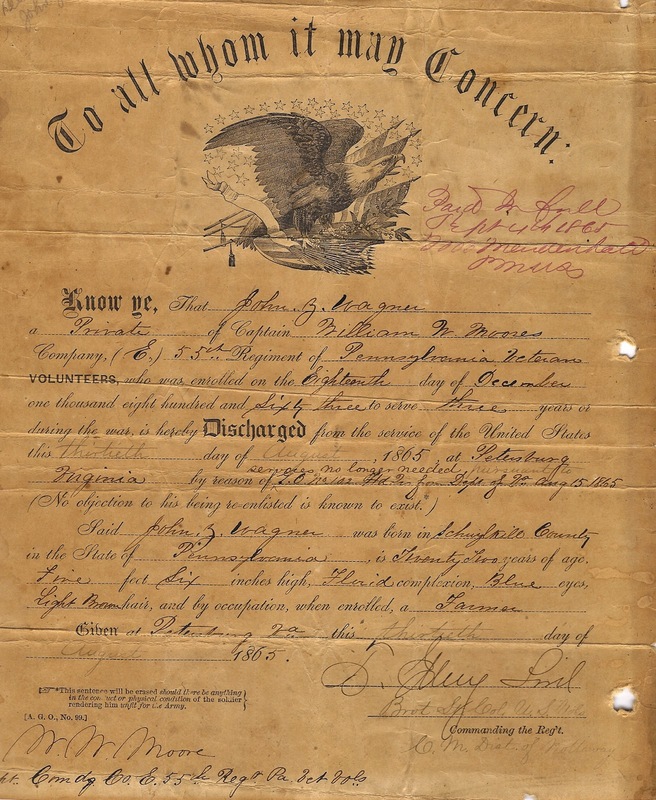 John Z. was mustered into the 6th regiment of the Pennsylvania Volunteer Infantry, Company E, to serve his 3 months of service to his country. He was part of the famous First Defenders that came from the great state of Pennsylvania. As we all know...what was thought to be a 3 month war, ended up being a 4 year struggle that would tear the country apart. 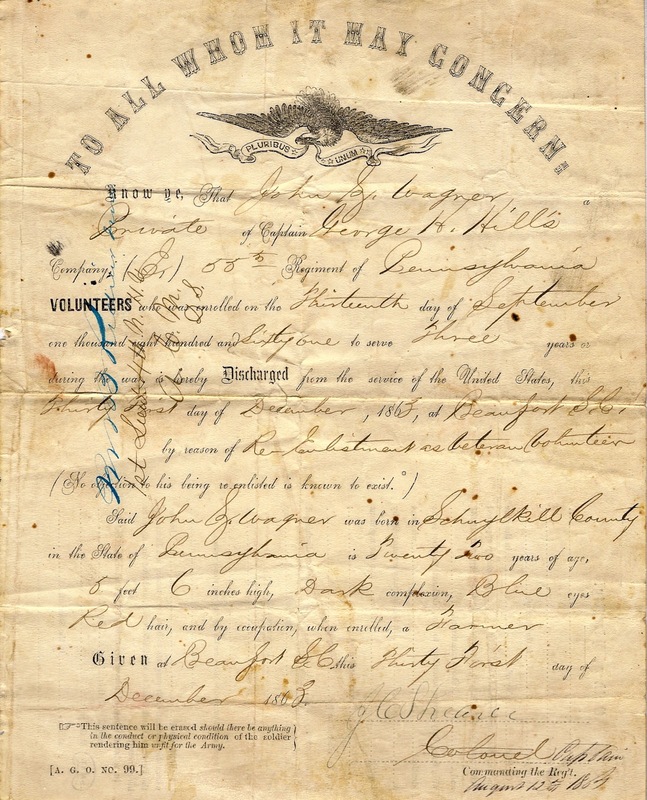 John Z. served his 3 months of duty...mostly on provost and guard duty in the Williamsport, Pa. area of the county and was mustered out of service on July 26, 1861. 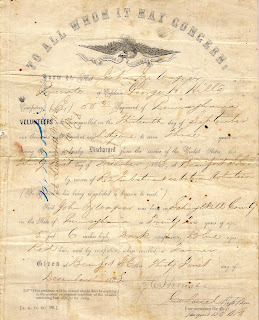 He would return home only to re-enlist in the newly formed 55th PVI (Company E) on September 13, 1861...after taking a 1 1/2 month rest from his prior service. As I mentioned in my prior posts, John Z. Wagner knew John W. Derr, owing to the close knit nature of the Deep Creek community. Eventually, his daughter Mary Ellen Wagner would marry the son of John W. Derr, George Washington Derr, my great grandfather. My great grandmother, Mary Ellen Wagner Derr...or Mom Derr...would produce 1 daughter and 4 sons, of which one was my grandfather, James Monroe Derr. My father, Donald James Derr, was born in 1927 and remembers, as a little boy, sitting on the lap of John Z. Wagner, as the old man would sing and talk to him. His great grandfather would still chew tobacco from a plug... taking the little tin brand markers that were pinned into the plug and pressing them into the window sill. That is what my father remembers most about John Z. Wagner. John Z. Wagner would serve all 4 years of the Civil War, surviving to become a hard working old man and living for 88 years. John Z. worked until he was 80 years of age, attesting to his good health and fortitude. 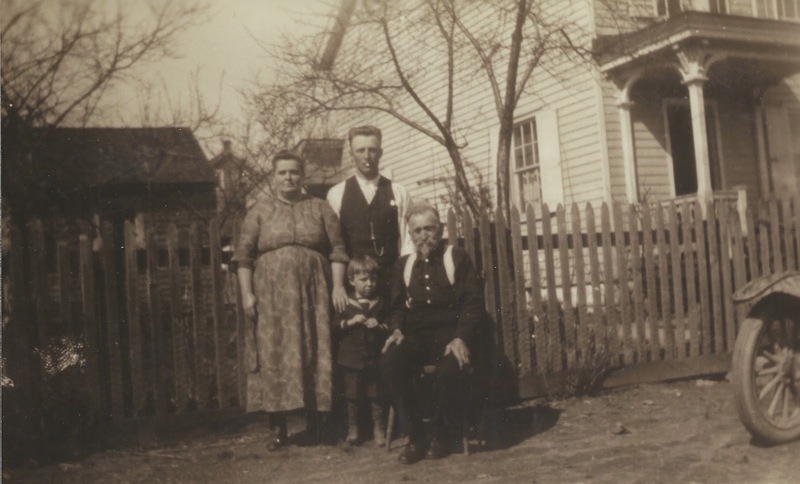 My Uncle, Walter Lee Rissmiller was born in 1923 and is also in a picture similar to the one you show above only it's with John Z., his daughter, Clara Matilda Wagner, her son Walter Edward Rissmiller, and my Uncle Lee. My father, Lee's younger brother, has had the picture for many years. Clara Matilda Wagner married Walter Rissmiller of Gordon, PA. My Uncle Lee talked of the Derr's often. I was quite excited to see the similar one you posted. 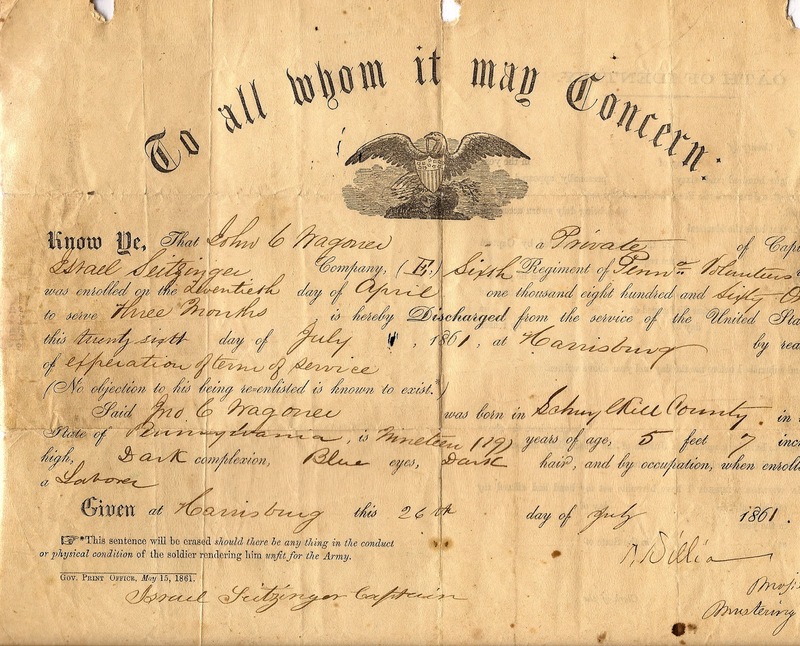 I am also a descendant of John Z. Wagner and Sarah Bixler. I have his military pension records that contain quit a bit of information. He actually served in PA 55th, Company E, and was wounded near the battle of Petersburg on June 14, 1964. His brother was William was killed in the battle of Petersburg, and is buried in the battlefield cemetery there. My great-grandmother, Clara, said he suffered a leg was wound, which is the reason he walked with a cane. PA 55th, Co. E saw quite a bit of action - He was first sent to Ft. Monroe, VA - then to Beaufort, SC, Wilderness, Battle of Cold Harbor, City Point, and the surrender at Appomatax. (When he couldn't farm any longer, he was also a carpenter). Would love to swap resources. Dear Anonymous...please send your email address to my jwdletters@gmail.com account and we can begin corresponding on John Z. Wagner and other possible ancestors in common. I have some stories and other original documents from John Z, along with a photo of the house he built in Deep Creek (Barry Township) Pa. It will take a bit of time to drag all of that out as I have them in storage and they are not easily retrieved...but I will eventually get them out again. Look forward to hearing from you! Jim Derr.